There has been a vigorous controversy over whether or not governments should add fluoride to our water supply. The practice of water fluoridation claims that you can prevent tooth decay by drinking water with sodium fluoride in it. The Nazis during the Holocaust added fluoride to water in their concentration camps as a means to make the prisoners more docile and less confident. 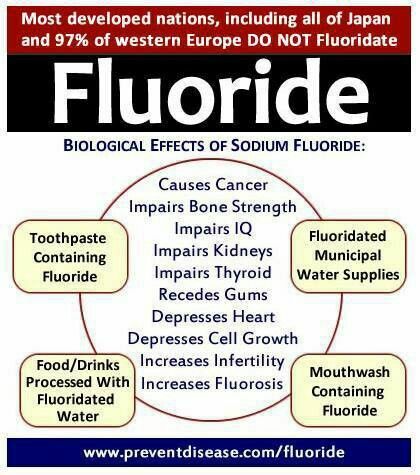 The United States government obviously understands this as a means to make prisoners less aggressive because fluoride is added to water in high amounts in prisons. Why is fluoride added to the public’s water supply then? Many people are starting to realize the truth while trying to avoid fluoride, so do water filters remove fluoride or is it unavoidable? Fluoride is an extremely toxic substance that can affect many areas of the body. This can be easily proven by looking at case studies in China and India where the water supply is heavily concentrated with fluoride, either naturally or by accident. Millions of people in these countries suffer from bone diseases due to their frequent exposure to very high levels of fluoride in their water. 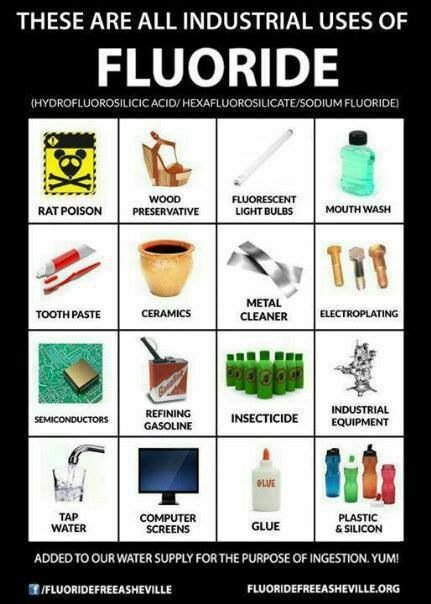 The horrible thing about this is that we are exposed to fluoride many times every day! Dentists insist on telling us that fluoride is good at preventing cavities due to “research” that was done decades ago. However, these studies are not accurate in their claims and were actually funded by factory corporations that had nowhere to dump their toxic fluoride byproducts. Well, the best place to dump it besides the environment would be our bodies! Maybe that’s why they funded this research to back up their claim that fluoride is healthy for us when it actually accumulates in our glands. It’s genius; Human cells act as toxic waste dumps! The eco terrorists won’t say anything now! Recent surveys by the CDC have predicted that around HALF of American teenagers have a dental condition called fluorosis. This is a condition of the tooth enamel caused by fluoride preventing the teeth from forming new cells that can retain essential minerals. The high incidence of fluorosis is likely caused by the many other sources of fluoride in our lifestyles other than the forced supplementation of it in our tap water. Processed beverage and foods: mechanically deboned meat, carbonated beverages, etc. Fluoride is found in high amounts in green and black tea that is not organic. Non-stick pans with Teflon are coated with fluoride. Prescription drugs are filled with high concentrations of fluoride. The claim that fluoride is good for our teeth is obviously very ironic. The hippocampus is the area of the brain that creates feelings of being in control, confidence, concentration, and spiritual awareness. Damage to this part of the brain will result in being docile with perception problems. You are more likely to submit to authority, not be skeptical, and be less angry. The Harvard study estimates that exposure to fluoride in the placenta (which can cross the blood-placenta barrier) can automatically lower the IQ of a newborn by half a point. Researchers frequently go to rural areas of China where fluoride is naturally concentrated in the water supply and discover that children in these areas suffer from developmental disorders and bone fragility. Some spiritual wellness advocates believe that governments purposefully add fluoride to our water supply so that our pineal gland will “calcify.” Ancient scriptures have constantly made references to the center “third eye” of the brain, which is assumed to be the pineal gland. Fluoride accumulates in this gland and displaces iodine, making it much less effective. The best way to avoid all the possible side effects of fluoride is simply avoiding it. Filtering tap water. You’ll need to purchase a type of filter that eliminates fluoride. Many filters do NOT filter fluoride. Drink spring water. Most brands of spring water have very low natural levels of fluoride with no synthetic sodium fluoride added like tap water. Drink distilled water. You can also purchase a water distillation system. This will remove most other compounds from water other than H2O. Use fluoride free toothpaste. Toothpaste has a very high amount of sodium fluoride. Even if you actively try to avoid swallowing it, the fluoride can be absorbed through the gums of your mouth. Eat more fresh food. Processed and packaged food is likely produced using a lot of water and pesticides. Eating fresh and organic produce can reduce your exposure to fluoride. Drink only organic green and black tea. The tea plant is heavily sprayed with pesticides that contain fluoride, which is an insecticide. Avoid non-stick cookware. They are coated with fluoride. Avoid mechanically deboned “pink slime” meats. Like the kind in fast food, they are heavily concentrated with fluoride due to the process of deboning the meat and adding fillers. This is an excellent water filter that I love. It will filter out EVERYTHING including fluoride so that you’re drinking natural water. Click the image for a great price! MSM is a supplement that can detox the glands of fluoride in our bodies. If you are using a refrigerator water filter or a low-quality jug like Pur or Brita, then the answer is NO, these products do not filter out fluoride. The sodium fluoride molecule is so small that it can easily pass through a physical filter. So how do you filter fluoride? You will need to invest in a water filter that uses activated alumina to trap the fluoride molecules. Filters like these will not only filter fluoride, but so many other chemicals and metals that do harm to your body as well. In my opinion, filters like Brita, Pur and Zero water cost 20 dollars for a reason: they are garbage. They are simple sand filters that really don’t filter much except large particles in your tap water. A tap water filter that actually works is this one. It will filter out EVERYTHING and leave you with clean, pristine and fresh water. This water filter is extremely high quality and will last for MUCH longer than a 20 dollar Walmart filter. Fluoride is the smallest molecule you can filter from water. Aquagear claims that it will remove up to 100% of metals, pesticides and particles and up to 95% of fluoride. This is extremely impressive. It is also an excellent price for its quality. Health is wealth and if you seriously want to experience the benefits of a fluoride free life (one that is extremely rare nowadays) you’ll need one of these filters. It is very surprising how crisp the water tastes and how good your body feels after drinking it. No other water will compare. I am always here for you, so if you have a question or something to add about water filters removing fluoride, please leave me a comment! I really like fast website speeds. My advice would be to investigate the YSlow and page load time of your site. Thanks for coming! My Chinese friend told me about disease in her bones. It is pretty common for them and I will definitely warn her about fluoride. Maybe it is the reason of it and once she knows what causes it, she can find a solution for it. Fluoride can displace many of the essential minerals in our bodies. It also allows calcium to form calcium carbonate, which hardens our glands. We would never know because these conditions don’t cause pain or symptoms, but they do hinder the functions of our hormones and nervous system. Thanks for the input! I can see why thats can be a huge argument. It is rather questionable. As long as it does not make me sick, then I really would not care, but it did get me thinking. Great read. I think that’s the perspective of a lot of people. That’s unfortunate because we are all being medicated without consent for no reason. Plus, if there’s evidence to prove that the practice of adding halogens to our water can be harmful, why would we keep doing it? Thanks for the input!